Welcome to the Impression Obsession 2017 Fall/Winter (and more!) Stamp Release Hop! We have some beautiful new stamps to share AND Gift Certificates to give away! The Blog Hop will be posted on the Impression Obsession Blog at 6am EST each day Monday, July 17th – Friday, July 21st. The more blogs you visit, the better chance you will have to win!!! If you’ve arrived from Anna Wight's blog, you’re at the right place. If not please head to the Impression Obsession blog to start at the beginning of the hop. Today I am sharing a card created with one of the many new stamps available now at IO Stamps, Holly Joy (D19654). 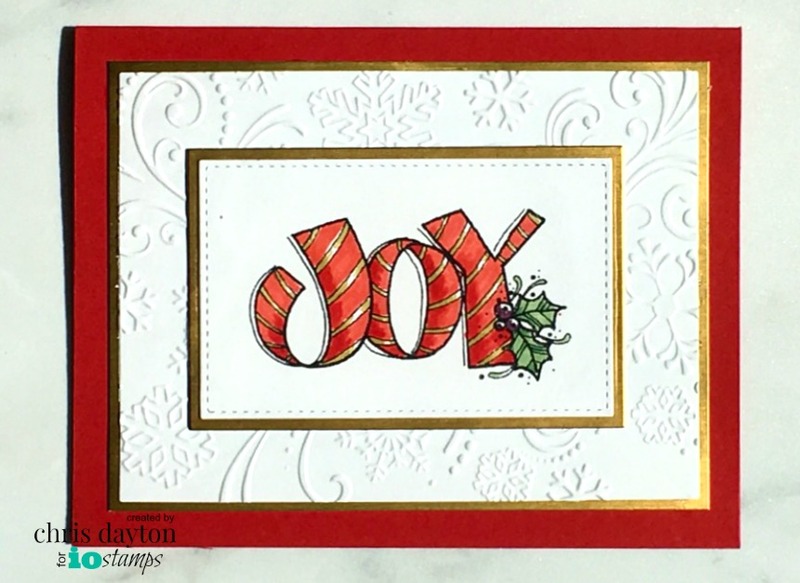 For this card I stamped the Holly Joy stamp on 80# Hammermill Color Cover Digital copy paper with Memento Tuxedo Black ink. I use this Hammermill paper often as a cost-friendly layering-weight alcohol marker paper. I colored the image with Copic Markers. I added Gold Wink of Stella to the stripes, and then trimmed out the panel with a stitched rectangle die. I layered my colored panel with a pieces of gold foil cardstock, and a white cardstock panel that I had embossed using the Snowflake Swirl embossing folder and a red card base. Thanks for stopping by today. Stop by again tomorrow for more new Fall/Winter fun! Your next stop in the hop should be Daniela Dobson's blog. Great holiday card. Simple and really pretty. Love the textures and layering! Pretty Holly Joy stamp! Great card. Thanks for the ideas. Super pretty, love the added dry embossing. A wonderful Christmas card for the holidays! love the dry embossing too. would hang as a decoration. Love the elegance and CAS design of this card! What a beautifully elegant Christmas Card. Very pretty--I like the embossed panel. I love the embossing on this card. great job. Beautiful card. Love the embossed background and JOY image. What a gorgeous combination of this wonderful stamp and the embossing behind it, Chris! Cheerful and fun Christmas design! Very pretty! Sweet image, love your card! Chris, the stamped/colored "JOY" backed onto the embossed snow swirls just say "winter" loud and clear. It's so lovely. TFS. I like the gold edging and embossed background on this pretty piece! Love this!!. I am making Christmas Cards to send to military for two different groups - one sending blank cards for them to send back to family and other making and signing. I love this - simple and beautiful!. Cute holiday stamp. Love the layering on your card!! Your card is so rich and festive. I like the layering you did to make the JOY stand out for a statement look. Gorgeous! I love the simplicity and the elegance of your card! Love all the texture your card has, from the embossed background, to the stitched die, to even the faux drop shadow on the letters. Love all the layers too! A joyful reminder to use embossing folders. Thanks Chris. Nice cheery Christmas card. I enjoy the joy stamp! Gorgeous! Love the pretty Joy & the embossing! Great card! Love this stamp, definitely looks like a great one for classic holiday cards. Thank you for sharing.